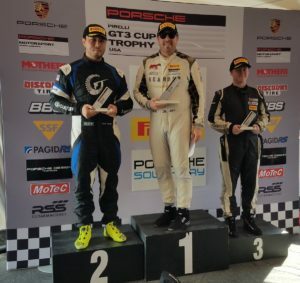 Tooele, Utah (3 June 2017) – Loren Beggs took his second victory of the season on Saturday in a wild Round 5 of the Pirelli GT3 Cup Trophy USA at Utah Motorsports Campus. 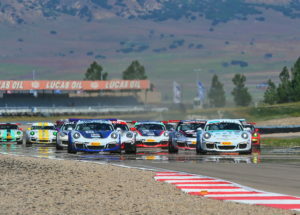 Temperatures hovered in the high 80’s in the late afternoon heat at the 3.048-mile, 15-turn road course Salt Lake City-area road course, known for its diverse racing lineup that includes cars, motorcycles, bicycles and karts. The drivers knew that pacing themselves and their tires in the desert dust would be critical to race success. Beggs put his No. 08 911 Design Porsche 991 GT3 Cup Car onto the pole position in qualifying and took the green flag determined to maintain the lead going into the tight Turn 1. As the field bunched behind him, Beggs worked hard to increase his lead but a full course caution flew on lap two for a dramatic incident involving the No. 23 Competition Motorsports Diamond Class Porsche of Chris Pallis. Pallis, tagged in the right rear by another car going into Turn 6, rolled several times in a spectacular incident but was checked and released from the infield care center. The top four in Diamond Class and Diamond Masters broke away from the rest of the field after the green flag flew. WinWard Racing’s Russell Ward and Aasco Motorsports’ Alex Kirby kept it close behind Beggs throughout the race, with mere tenths of a second separating the top four. Michael Zuiebeck spent the race comfortably in the train of top four cars at the front of the field, leading the Diamond Masters class. Zuiebeck, driving the No. 2 Porsche for Bob Faieta’s Southern California-based Competition Motorsports, was never able to shake WinWard Racing’s Bryce Ward or teammate Mike McAlister, but neither was the pair able to make a charge as track temperatures increased. “The race started off well for me – and I’m not always great at the start,” said Zuiebeck. “So that was a good omen. I slotted into third overall, keeping the same pace. My goal was to just stay with the top two Diamond Class guys, and if I could do that, I would do well in my class. There was no let-up at all – it was hot, and I was just waiting for that checkered! 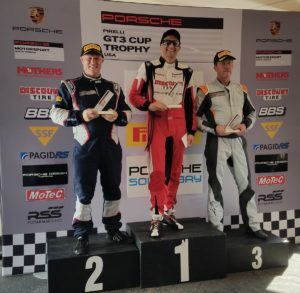 In the Platinum Class (for Porsche 911 997.2 versions), point leader Ray Shahi started second and took the lead from Salt Lake City resident and UMC veteran David Lockwood in the lap two melee – for which he had a front-row seat. He extended the lead early in the race, but Lockwood refused to let him get away, filling Shahi’s mirrors for the final five laps of the race and drawing alongside at the checkered flag. 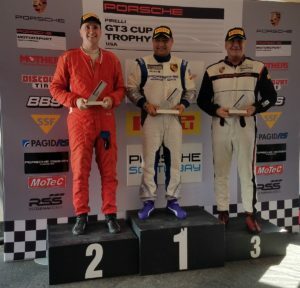 The Silver Class (for Porsche Cayman GT4 Cup Cars) saw a race-long battle, as the top three exchanged positions for much of the early going. Sean McAlister put his No. 00 Competition Motorsports Porsche GT4 Cup Car on the pole, with three-time race winner Jeff Kearl of Reardon Racing second. But at the green flag, GMG Racing’s Carter Yeung blasted from 5th into the lead going into Turn 1. McAlister and Kearl reeled in Yeung in the early stages of the race, putting Yeung back into third position. In what is sizing up to be a season-long fight for the Silver Class title, Kearl and McAlister battled hard, separating themselves from the field. With electronic issues for McAlister, Yeung came back to take second position as Kearl went on for the win. The win was especially meaningful for Kearl, who moved to California from Utah in 2007, but not before driving at the brand-new track, then known as Miller Motorsports Park. 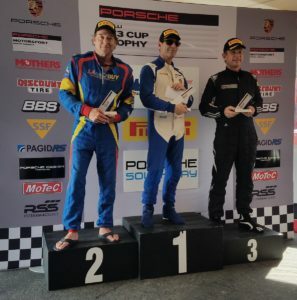 The Silver Masters class saw the third-straight victory (from pole) for Competition Motorsports veteran Steve Goldman. Driving the No. 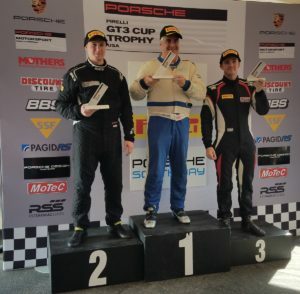 1 Competition Motorsports Porsche GT4 Cup Car, Goldman held off returning teammate Mike Sullivan and Flying Lizard Martin Brauns.